McKesson Regular Underpads for bed or chair protection are designed to cover mattresses in order to absorb leakages, reduce odors and maintain dryness. They consist of a polyethylene layer combined with sealed edges to ensure leakage protection. The highly absorbent material is evenly distributed throughout the core. McKesson Regular Underpads are designed for patients unable to use body worn products due to skin irritation and infection. Also used to cover mattresses in order to absorb leakages, reduce odours and maintain dryness. They consist of a polyethylene layer combined with sealed edges to ensure leakage protection. The highly absorbent material is evenly distributed throughout the core. McKesson Regular Underpads use 100% virgin fluff pulp, which provides far greater levels of absorption and retention than draw-sheets or wadding-filled pads. Unlike other incontinence products that require washing and are very expensive, these sheet protectors are completely disposable and very cost effective. The McKesson Regular disposable underpads also offer the added benefit of a smooth side to help in patient transfer and repositioning! Each McKesson Regular underpad features a soft, non-woven bonded topsheet that promotes rapid fluid acquisition. The interior liner of these disposable bed pads is soft to the touch, vented to keep cool, and non-irritating to the user’s skin. The outer barrier is soft and smooth, assisting you with repositioning and/or transferring your patients. 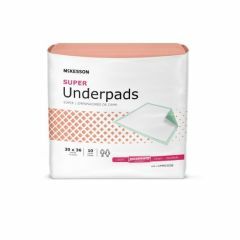 McKesson Regular disposable underpads are available at different levels of protection, with Light Pads for light wetting and Regular for slightly more absorbency, and Ultra and Breathable for the maximum absorbency. These are Regular underpads. Bed Protector. Furniture Protector. Soaking up spills. Puppy pee pads. Larger Size. None I can think of!. Puppy training pads are EXTREMELY expensive. These are larger, just as absorbent and cost much less. Is it Medium Absorbency or Light Absorb? Used on sofa &amp; chairs as well as night time in bed. I have found sturdier products which are preferred to this one in which the backing tore easily. Have ordered 3 different products; these work best for combination of price, protection, and thickness. This product is being used for my bedridden Dad. He is not able to leave the bed at all. This greatly helps with his incontinence even though he is in diapers. I would recommend for permanently bedridden patience. I'm not familiar with any fabric that would be water-proof. Some layers of under her may help some and you could shop thrift stores for inexpensive cottons you could dispose of as necessary. Hope this helps some. The backing is plastic but I have no problem with using it on the bed or on a chair.